Historical: The purpose of this vehicle was to provide mobile facilities for crane, shovel, dragline, clamshell and pile driver operations. Length: 7.05 m (275 inches). Width: 2.60 m (101 inches). Height: 3.45 m (134 inches). Weight: 17.300 kg (38.060 lb.). Engine: 6-cylinder Hercules, type WXLC-3, 6.620 cm3 (404 cubic inches), liquid cooled. Horsepower: 118 at 2.800 rpm. Fuel capacity: 190 liter (42 gallons). Range: 400 km (260 miles). 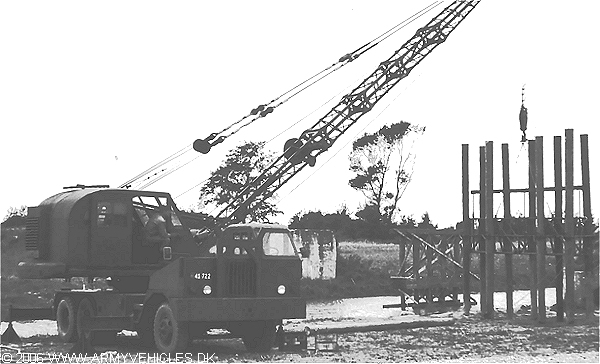 Additional: The crane was driven by either a 8-cylinder Chrysler C36-520 engine developing 140 hp or a 6-cylinder Hercules JXD engine developing 120 hp. Max. lifting capacity was 8 ton.